Anti-Muslim hatred ratcheted up sharply after the Islamic State attacks in Paris. Then came San Bernardino and Donald Trump. Standing with President Francois Hollande of France 11 days after Islamic State terrorists slaughtered 130 people and injured more than 350 others in three coordinated attacks in Paris, President Barack Obama told Americans to refuse to give in to fear. “There have been times in our history, in moments of fear, when we have failed to uphold our highest ideals, and it has been to our lasting regret. We must uphold our ideals now. Each of us, all of us, must show that America is strengthened by people of every faith and every background,” he said at the Nov. 24 press conference. 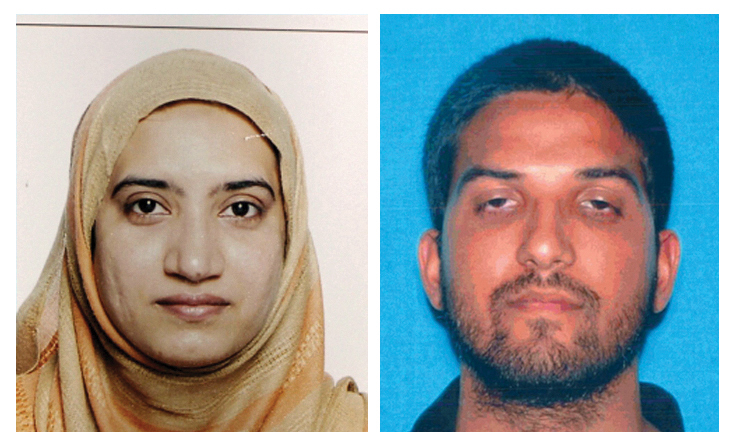 Obama took up the same theme on Dec. 6, three days after a married couple, inspired by Islamic State propaganda, murdered 14 in a terrorist attack at an office party in San Bernardino, Calif. “We cannot turn against one another by letting this fight be defined as a war between America and Islam,” he said. 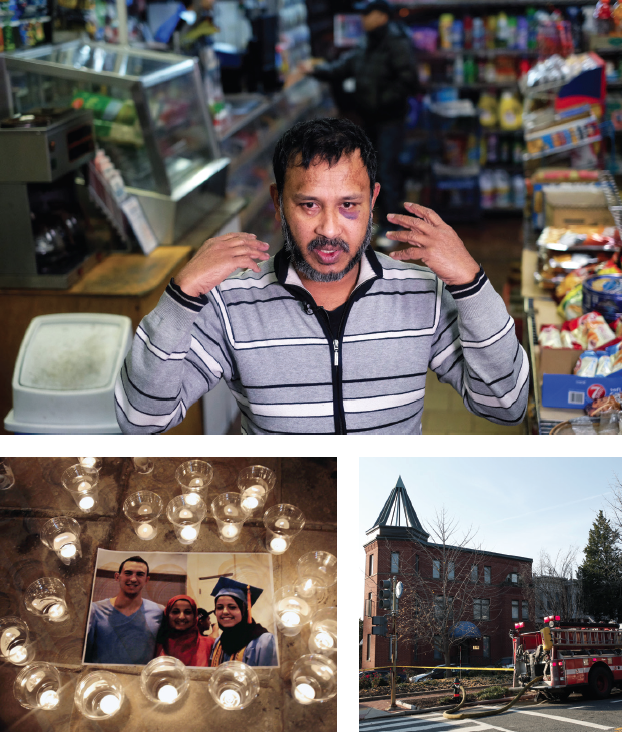 Despite the president’s words — and warnings from the Pentagon that alienating Muslims would endanger national security — there was an extraordinary flood of anti-Muslim attacks in the wake of the Paris and San Bernardino massacres. There had already been several noteworthy attacks on Muslims in 2015, particularly the February killings of three young Muslim Americans in Chapel Hill, N.C., by a man known for his hatred of religion. But after the Nov. 13 mass murder in Paris, vandalism and arson, shootings and beatings, along with threats and declarations of hatred and everlasting war against Islam, seemed to explode. Egged on by a steady drumbeat of propaganda from Islamophobes and given a megaphone by the press and a presidential frontrunner given to racist and Muslim-hating oratory, already-simmering anti-Muslim sentiment in the U.S. reached a fever pitch. Two days after the Paris attacks, a University of Cincinnati pre-med student wearing a hijab had to be snatched out of the way of a car that accelerated toward her, its driver honking and calling her a terrorist. The next day, a Muslim family in Orange County, Fla., returned home from a charity event to find bullets lodged in their garage and master bedroom. That same day, an Uber passenger in Charlotte, N.C., mistook his Ethiopian Christian driver for a Muslim and attacked, punching and threatening to shoot him in the face, and in Norman, Okla., a man allegedly told police, “[I’m] going to go out there and just start shooting anything that looks like a Muslim.” He was shot and wounded by officers responding to his home after he allegedly pointed a gun at them. On Nov. 19, a sixth-grader in Bronx, N.Y., was attacked by classmates who called her “ISIS,” put her in a headlock, punched her, and tried to rip off her hijab. The next day in Pittsburgh, a Muslim cab driver was shot in the back by a passenger who had inquired about his religious affiliation and spent the ride ranting about Islam. On Dec. 8, a Queens, N.Y., convenience store owner reported being beaten by a customer who punched him in the head and said, “I want to kill Muslims.” Two days later, the Council on American-Islamic Relations buildings in Washington, D.C., and Santa Clara, Calif., were evacuated after receiving letters containing white powder, which was eventually found to be harmless. A few days later, a Muslim woman was nearly shot by an unknown person who fired at her as she left a Tampa, Fla., mosque. Another Muslim woman driving away from another mosque in the area said a man threw rocks at her and then tried to run her off the road. Meanwhile, other mosques were shot at, menaced with fake explosive devices, firebombed, threatened and protested. One had a severed pig’s head tossed at it, and still another’s copy of the Koran was smeared with feces. Irving, Texas, was a sort of microcosm of the rest of the nation. 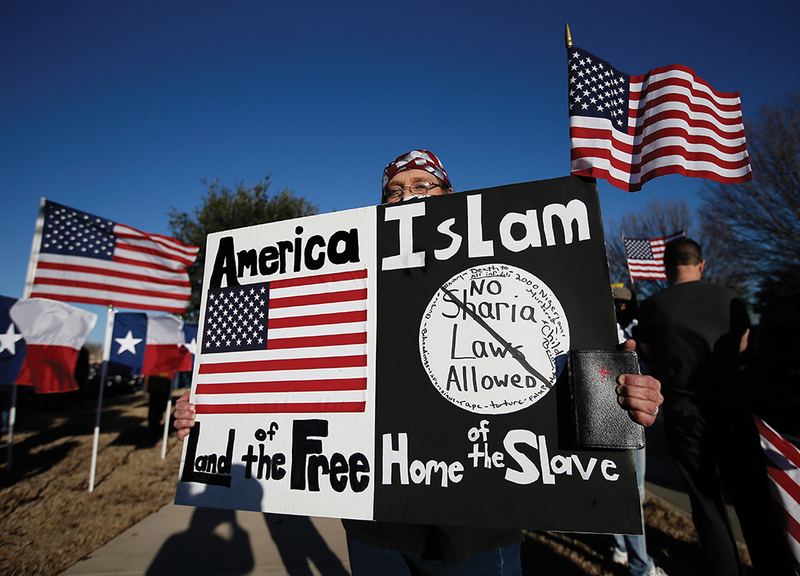 A Dallas suburb of 230,000 that is home to one of the largest mosques in America, Irving was the site of multiple anti-Muslim demonstrations and events. Four days later, Wright published the names and addresses of local Muslims and “Muslim sympathizers” on Facebook, as well as a message: “We should stop being afraid to be who we are! We like to have guns designed to kill people that pose a threat in a very efficient manner.” In the weeks that followed, a sort of counter-protest movement evolved, with individuals who are not Muslim but support the right of Muslims to worship in peace showing up to defy Wright’s group. But the protests showed no signed of stopping — in one case, the Texas Rebel Knights of the Ku Klux Klan announced plans to demonstrate at the mosque in May 2016. As in the rest of America, Islamophobia was a problem in Irving well before the latest Paris attacks. In February 2015, Mayor Beth Van Duyne reacted with outrage to the existence, in nearby Dallas, of an Islamic tribunal whose purpose is to use Shariah law to settle civil disputes within the local Muslim community. Though American Jews, Catholics, Amish, and other religious groups use religious tribunals on a voluntary basis to settle civil disputes (but not criminal matters) amongst themselves, Van Duyne condemned the mediation panel in the strongest of terms, suggesting it was a stealth effort to replace American law with Shariah. In March, she asked the Irving City Council to endorse a state bill outlawing the already illegal use of foreign law, including Shariah, in state criminal courts. That wasn’t the end of it. In September, Irving school officials made national headlines when they sent Ahmed Mohamed, a nerdy ninth-grader, out of the school in handcuffs after accusing him of making a fake bomb. The bomb turned out to be a homemade clock, and, for his troubles and his smarts, the 14-year-old landed an invitation to the White House. But his family, shaken by the incident, withdrew all their children from Irving’s schools and said they were moving to Qatar. For his part, armed protest organizer Wright claimed to represent a new group called the Bureau of American Islamic Relations (an obvious mimicking of the Council on American-Islamic Relations, a Muslim civil rights group). He is also allegedly associated with the so-called III Percenters, a national movement of gun-toting, antigovernment “Patriots” that takes its name from the discredited myth that only 3% of colonists fought against the English in the American Revolution. 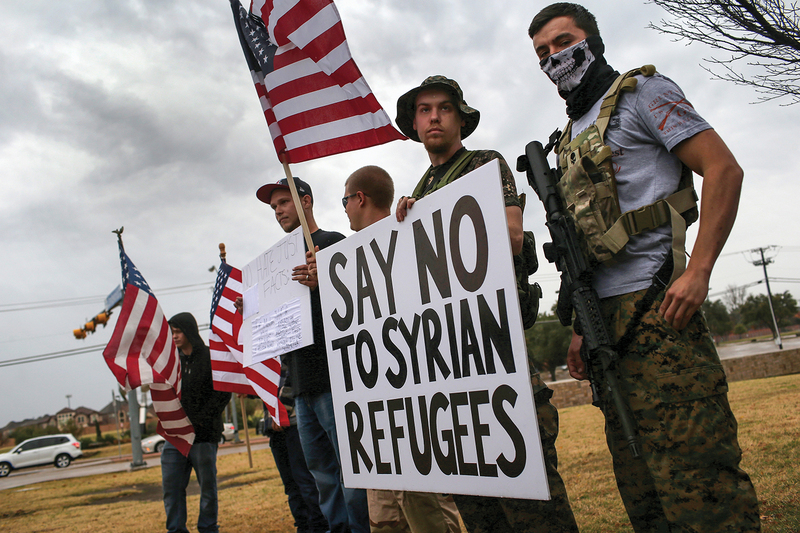 The ramping-up of anti-Muslim sentiment — in Irving and across the country — did not begin only after the Paris and San Bernardino attacks of late 2015. Recently released FBI hate crime statistics for 2014 show that hate crimes against Muslims rose that year by about 14%, even as hate crimes in every other major category dropped. The increase was apparently driven by reports of atrocities by the Islamic State, mainly in Africa and the Middle East. Although the 2014 rise was relatively small, there seems to be little doubt that when the 2015 numbers are published by the FBI in late 2016, they will reflect a dramatic jump. The tone for 2015 already was set in January with the deadly assault by jihadist terrorists on Charlie Hebdo, a French satirical magazine, and other French targets. After that, it seemed American Muslims were powerless to cool the growing ardor of their haters. When a group gathered in Garland, Texas, later that month for an event themed “Stand with the Prophet against terror and hate,” anti-Muslim protests followed. “They were not grateful that local Muslim-Americans had taken it upon themselves to combat extremism, but rather outraged that Muslim-Americans would dare to gather publicly at all,” observed Vox’s Max Fisher. Other attacks — mostly abroad but also including a thwarted attempt by two jihadists to shoot people gathered at a deliberately provocative Muhammad Art Exhibit and Contest held in Texas in May, and the July murders of four Marines and a sailor in Chattanooga, Tenn., by a Muslim gunman — only fueled the fire. So did a media landscape that treats every issue as if it’s up for debate, fails to fact-check before it broadcasts, and repeatedly showcases pundits with histories of demonizing, ill-informed and factually inaccurate statements. Following the attacks on Charlie Hebdo, for instance, Fox News “terrorism expert” Steve Emerson claimed that certain parts of Europe are “no-go zones” where “non-Muslims just simply don’t go” — a baseless myth that earned him international criticism and mockery. Emerson later apologized, but that did not stop other Fox pundits and politicians from repeating and amplifying Emerson’s assertion — among them Louisiana Gov. Bobby Jindal, a former GOP presidential candidate whose claims about British no-go zones were similarly ridiculed. The problem goes beyond right-wing conspiracy theorists and haters on the Internet, and beyond the Fox News shows that regularly offer platforms to paranoid Islamophobes like Emerson and hate group leaders like Robert Spencer. Liberal satirist Bill Maher, an outspoken atheist whose broad critique of religion has become increasingly ugly when it comes to Islam, said of the faith: “What we’ve said all along, and have been called bigots for it, is when there’s this many bad apples, there’s something wrong with the orchard.” Richard Dawkins, an abrasive British scientist and fellow atheist, has also been relentless on the subject. “To hell with their culture!” he said of Muslims on Maher’s television show in November. But increasingly as 2015 drew to a close, the loudest Islamophobic voices came from Republican presidential candidates — most notably Donald Trump, who had also suggested that Mexico was deliberately sending “rapists” and “drug dealers” over the border, endorsed and publicized utterly bogus statistics about black crime that originated with an apparent neo-Nazi, and even declined to condemn the roughing up of a black protester by members of the audience at one of his rallies. Trump and Carson were speaking to a like-minded base. That same month, a survey by Public Policy Polling, a Democrat-affiliated polling outfit, found that 72% of North Carolina GOP primary voters thought a Muslim should not be president and 40% believed Islam should be illegal in the United States. On Nov. 16, New Jersey Gov. Chris Christie, another GOP presidential candidate, said the United States should not admit a single refugee from the Syrian civil war — not even “orphans under age 5.” He was quickly joined by more than half of the nation’s governors, including fellow GOP presidential candidate and Ohio Gov. John Kasich, in saying Syrian refugees would not be welcome in their states. GOP presidential candidate Mike Huckabee seemed to agree, saying, “I don’t know of any other group of people uniquely that are targeting innocent civilians and committing these acts of mayhem.” Cruz’s and Huckabee’s assertions about the supposedly unique danger posed by Muslims are telling in light of the fact that since Sept. 11, 2001, domestic right-wing extremists have been responsible for about the same number of deaths in the United States as radical Muslims (48, as opposed to 45 killed by jihadists, according the New America Foundation) — including, most recently, the November murder of three people at a Colorado Planned Parenthood clinic (see story, p. 7) by a man who had earlier professed admiration for anti-abortion terrorists. Trump, meanwhile, continued to ratchet up his rhetoric. On Nov. 21, he revived a completely debunked anti-Muslim myth when he claimed to remember seeing “thousands and thousands” of Muslims in New Jersey cheering as the World Trade Center collapsed following the 9/11 attacks. Confronted with police and media investigations that concluded decisively that such celebrations did not happen, Trump simply refused to back down. On Dec. 7, he made his most extreme proposal yet. “Donald J. Trump is calling for a total and complete shutdown of Muslims entering the United States until our country’s representatives can figure out what is going on,” began a press release that Trump read aloud to a crowd. Even so, Ryan and many other Republican leaders have pledged to support whoever gets the party’s nomination, and polling suggests that 25% of American voters, and 42% of Republicans, approve of Trump’s plan to temporarily halt Muslim immigration to America. Meanwhile, in announcing his proposal, Trump cited data from a poll by the Center for Security Policy supposedly showing that “25% of those polled agreed that violence against Americans here in the United States is justified as a part of the global jihad” and that 51% “agreed that Muslims in America should have the choice of being governed according to Shariah.” The statistics came from an “opt-in” poll that was unscientific and contradicted by others with starkly different results. This reference also provided powerful evidence that Trump had not come up with these anti-Muslim ideas all by himself. Instead, he apparently was relying on the baseless claims of Center for Security Policy founder Frank Gaffney, an anti-Muslim conspiracy theorist who believes that the Muslim Brotherhood has infiltrated the highest levels of government, once called for the revival of HUAC-like panels to grill American Muslims about their loyalties, and thinks the Oklahoma City bombing may have been the work of Saddam Hussein. That Gaffney is so extreme that he’s been banned from the Conservative Political Action Conference, the conservative movement’s premiere yearly gathering, probably earns him points with Trump, who takes obvious pleasure in insulting establishment politicians on both sides of the aisle. What may be most disheartening is that Trump’s rhetoric is only keeping pace with the worst instincts of a large portion of the population that, frightened by world events and goaded by many media outlets that encourage “debate” about the basic humanity of Muslims, has embraced a xenophobic and nationalistic world view.